I'm also proud that I can add not just another black metal band - which isn't a critique. 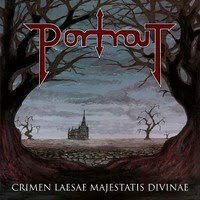 But it's nice to see that there aren't just evil black and white guys running through foggy forests out there which use latin chants for singing about Satan and darkness... well, ehm, Portrait sings about Occultism as well. Maybe they are a black metal band, but they don't know it yet. We'll see. By the way, the album's title means The crime of having offended/ injured the divine majesty or, in other words: blasphemy. "Crimen Laesae Maiestatis" is the medieval term for having committed a crime by acting against the majesty or insulting him by words.